On a cold winter day, in a remote location high in the Pyrenees, an old man is bent over his desk intent on completing an ambitious, eccentric project. Time is against him. He is an enigma—reclusive and unknowable. 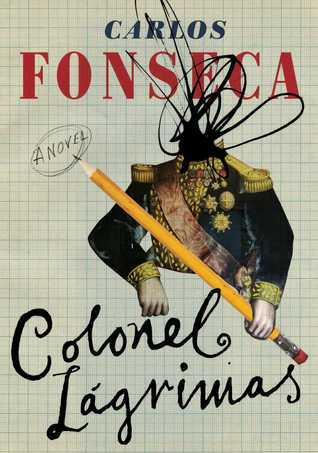 And the goal of Carlos Fonseca (Suarez)’s infectious debut novel, Colonel Lágrimas, is to attempt to unravel and piece together the true identity of this strange man and the circumstances that led him to this place. But it’s no ordinary investigation and the colonel at the centre of attention is a military man only in his own imagination. He is, or rather was, a brilliant mathematician, a cryptic solver of abstract puzzles, who at the height of his fame, suddenly retreated from academia, embarking on a strange journey toward isolation and obscurity. Where is the border of the private? Where is the sentry to tell us when we should stop, draw a line, move no closer, and have a little respect? We imagine that at some point, when we’re getting too close, we’ll no longer see him and only the pixels of the background will be left, atmosphere with no storyline. The pleasure of the intruder. Thus, by playing the voyeuristic detective narrator’s close observations of the colonel’s daily routine and his current effort to record the lives of three imagined alchemical divas against a collection of historical anecdotes we begin to build an image of an old man racing against time to contain an essence of a history he is trying to forget. Woven into the narrative are descriptions of faded photographs, aphorisms from his father’s notebook, and postcards from a long correspondence with Maximiliano, a Mexican who gets inextricably bound in his former hero’s eccentric archival efforts. Themes repeat, patterns form. And binding it all is the regular appearance of a doodled spiral of barbed wire and a complex algebraic equation that are assumed to be connected. Gradually, layer by layer, a picture starts to take shape. The fragments are the pixels needed to construct a fuller portrait of the life of our solitary subject. His is a life that crosses many of the major events of the twentieth century—the Spanish Civil War, the Second World War, Vietnam—albeit a step out of time or logic, forever anachronistic. We learn that our “young colonel” rejected his past and began a lifelong pattern of slipping behind masks at an early age. He headed off, on his own, to occupied Paris, when he was ten. Within a few years he had adopted the role of an orphan. Later, having earned respect as a mathematical genius, he suddenly tosses it all to teach math in Vietnam during the war. At present, on the day we spend watching him in his absent-minded pursuits, he is engaged in writing the “autobiographies of other people,” his trio of historical divas. Or are they a means of assuaging a guilt that has driven his odd behaviour? That is not an easy question to answer. There are two ways of approaching the colonel. You can see him from a distance, his romantic profile like a tired genius who finally surrendered to the madness of endless projects. Easy to see him in this genius-like aspect, prisoner of dementia, a captive of the memory of his traumatic childhood. More difficult though to approach him to the point of belief, to where we believe in his projects. To see him up close in his more criminal profile: no longer a genius, no longer mad, but rather a man who waited, patiently, until the day came that would strip him of his talent so he could sit down to write what he always wanted. As a portrait of our stateless colonel is fleshed out in what is more a process of questioning, refining, and focusing possibilities—attempting to solve an individual life as an algebraic equation—it is impossible not to feel pity for this man who struggles with writer’s block, has an unknown audience waiting outside his bathroom door as he sings in the bath, is observed as he dresses up in his finest regalia, and critiqued as he performs a drunken oratory in what he can only assume is the guarded privacy of his own home. Examined as a collection of data, analyzed and psychoanalyzed in his waning days, he will not be allowed to slip quietly into obscurity. And whether that would secretly please him or not, we will never know. Colonel Lágrimas is translated from the Spanish by Megan McDowell and published by Restless Books. I like the sound of this. Not sure it’s for me right now, though: too much else vying for attention. It’s on my radar now, though – thanks. Truth be told, I had it for a few months after reviews I read late last year really caught my fancy. It’s a very enjoyable read. Excellent review – you made much more of this than I did. I certainly admired its cleverness, but I found I couldn’t connect with it in any other way. It did seem like an abstract puzzle which I wasn’t willing or able to solve! On the surface I loved the narrative voice and rhythm of the repetition and language, but after reading the interview the way I started to see the structure deepened. I think I will grow to love this work more and more over time. It would be great for the right book club. Fortunately math is not required, the real question is : what would drive a genius to retreat mid-career to devote himself to such obscure, eccentric projects? The real man who loosely inspired this book is just as fascinating and bizarre. This sounds absolutely fascinating, complex and unusual. Unfortunately not available in either of my libraries, so I’ll have to wait to read this one. But it is a very intriguing premise. Wonderful review. Thank you! I have your last two reviews bookmarked to read properly and comment on, by the way. You’ve been reading some books I’ve been curious about lately.